Conference champion Marshfield Columbus Catholic had three of the six first-team selections on the 2018-19 All-Cloverbelt Conference East Division Boys Basketball Team. Columbus Catholic won its fourth-straight Cloverbelt East championship, posting a perfect 16-0 record. 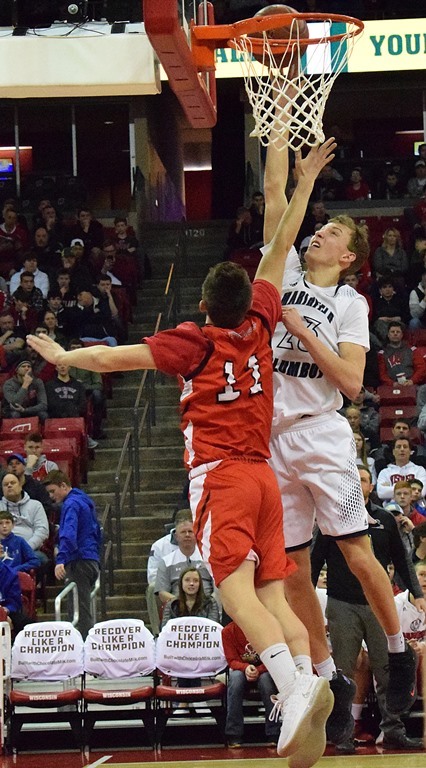 The Dons finished the season 26-3 after reaching the WIAA Division 5 state championship game before falling to Sheboygan Area Lutheran. Columbus seniors Bryce Fuerlinger, Jarred Mandel and Noah Taylor were named to the first team, along with Neillsville’s Alex King and Braden Trunkel, and Gilman’s Aaron Nagel. Fuerlinger led the Dons in scoring at 16.1 points per game and the conference in rebounding at 13.6 per game. He set new Division 5 state tournament records for most rebounds in a game (25) and in a tournament (34). Taylor averaged 15.9 points per game while Mandel averaged 14.8 points, 4.9 rebounds and 5.2 assists per game, while leading the Dons with 63 made 3-pointers. King, a junior guard, led the conference in scoring at 21.8 points per game, and was named Cloverbelt East Player of the Year. Trunkel, a sophomore, led the conference in 3-pointers with 73 and averaged 15.2 points per game. Columbus senior forward Ethan Meece was a second-team pick. Meece averaged 14.2 points and 4.4 rebounds per game for the Dons. Also named to the second team was Spencer junior Austin Bacon, who led the Rockets in scoring at 17.6 points per game. Kole Bogdonovich and Zach Zimmerman of Loyal, Neillsville’s Monte Diestler, and Owen-Withee’s Dylan Tomczak were also named to the second team. Columbus Catholic senior Kellen Heinzen, Colby’s Matthew Roth, Greenwood’s Cole Zimbauer, Loyal’s Quinn Brussow, Neillsville’s Hunter Hand and Isaac Weiers, and Owen-Withee senior Marcus Ackerman was among the honorable mention selections. First team: Bryce Fuerlinger, sr., Marshfield Columbus Catholic; Jarred Mandel, sr., Marshfield Columbus Catholic; Noah Taylor, sr., Marshfield Columbus Catholic; Aaron Nagel, sr., Gilman; Alex King, jr., Neillsville; Braden Trunkel, so., Neillsville. Second team: Ethan Meece, sr., Marshfield Columbus Catholic; Kole Bogdonovich, jr., Loyal; Zach Zimmerman, sr., Loyal; Monte Diestler, jr., Neillsville; Dylan Tomczak, sr., Owen-Withee; Austin Bacon, jr., Spencer. Honorable mention: Matthew Roth, sr., Colby; Kellen Heinzen, sr., Marshfield Columbus Catholic; Dallas Skabroud, sr., Gilman; Torgor Crick, sr., Gilman; Noah McConkey, jr., Granton; Cole Zimbauer, sr., Greenwood; Quinn Brussow, sr., Loyal; Hunter Hand, sr., Neillsville; Isaac Weiers, jr., Neillsville; Marcus Ackerman, sr., Owen-Withee. Player of the Year: Alex King, Neillsville.